Brussels’ residents in the habit of passing by the city’s ‘European quarter’ are used to seeing colourful and creative demonstrations. People from all across Europe regularly convene on the Belgian capital to try and get the ear of EU decision makers. But even those most seasoned in the quirks of the so-called ‘EU bubble’ will have done a double take this morning if they saw the giant inflatable elephant that was positioned outside the Commission’s Berlaymont building. 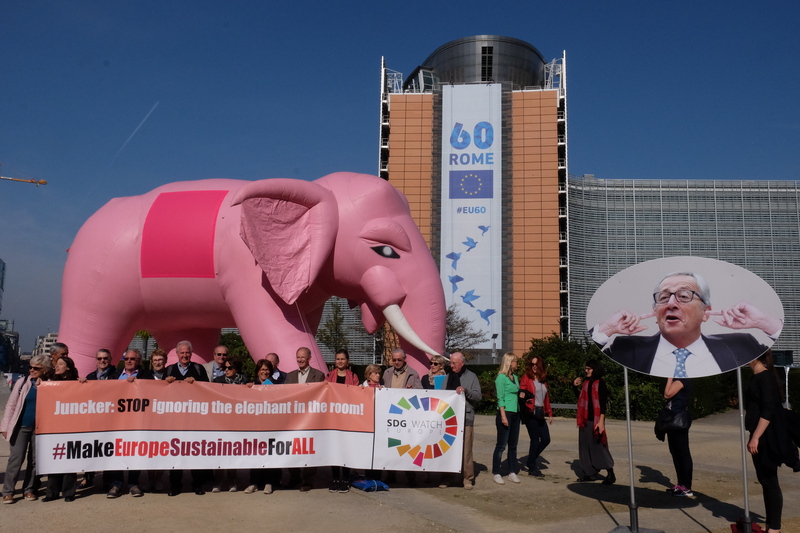 Activists used the pink pachyderm to draw Commission President Jean-Claude Juncker’s attention to the EU’s commitment to meet the 17 UN Sustainable Development Goals (SDGs), which were signed two years ago in New York by 193 governments. While two years have passed, the EU has not yet adopted any plan on how to achieve the goals in Europe. President Juncker made no mention of the SDGs in his State of the Union speech earlier this month which was widely viewed as telling of where the goals lie on his to-do list. Next ArticleFarewell to the American Mink and the Hottentot Fig?